This set of MATLAB Multiple Choice Questions & Answers (MCQs) focuses on “Laplace Transform – 1”. Explanation: The default laplace transform computed by MATLAB is the Unilateral Laplace transform. Bilateral Laplace transform can be computed separately but it’s not the default process. Explanation: The laplace command won’t understand 1 is a unit function. Also, if we don’t define t as symbolic, it won’t be able to understand ‘t/t’. Finally, sym t doesn’t properly define t for using it in the laplace command so we need to write t=sym(‘t’) while using the sym command. Instead of this, we write syms t to define it, as a symbolic variable, for the laplace command. 3. How many time domain representations of the following signal is possibly stable? Explanation: One of the conditions in condition for stability is that the R.O.C of the signal should include the imaginary axis. In options 2 for sigma>-1 and 2 for sigma>-3, the condition is satisfied but there is only 1 time domain representation in such case. We also have option Only 1 for -3<sigma<-1 which is true for the given range of sigma. Option 1 for sigma<-1 is not stable since the imaginary axis is not included. Explanation: The transfer function of the system is determined with 0 initial conditions. Since it’s the laplace transform of the impulse response, the impulse response should not have any initial conditions. b) The laplace transform of the time reversed ramp function. Explanation: We cannot define ‘-t’ as symbolic i.e. we can only define an alphabet as symbolic but not a character symbol like ‘-‘ or ‘+’. This leads to a syntactical error. There is no logical error. Explanation: The output would’ve been option b but we have given z,p within parentheses. They should be placed within  to get the proper output since the command tf2zp evaluates. Explanation: If poles don’t lie on the left half of s-plane, the system is not stable. An unstable system yields an erroneous final value which i.e an erroneous steady state response. They also cannot lie on the imaginary axis. Hence, the theorem is applicable only in case of poles lie on right half of s plane. Explanation: The first error MATLAB observes is that the input to the Laplace command is given within . It should always be within parentheses. The next error is that the input is given within ‘’ which makes the input act like a stirng and this is also an error. 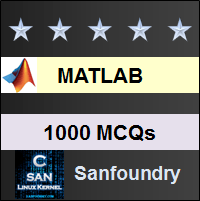 Since MATLAB returns the first error, the output would be error due to . 9. If f(t)=f1(t)+f2(t), the laplace transform of f(t) exists if f1(t) and f2(t) does not have the same R.O.C. Explanation: If the functions f1(t) and f2(t) do not have the same R.O.C., the laplace transform of f(t) won’t exist. This is because f(t) is a result of addition of both the function and if one of them doesn’t exist, the entire function would collapse. 10. What is the output of the following code? Explanation: The function is wrongly spelled, it should be residue and this leads to an error. The output would’ve been returns the transfer function as partial fractions if the function was correctly spelled. 11. What is the output of the following code? Explanation: Since the residue function returns multiple outputs, the output should be taken in a vector. But here, the output is taken within parentheses and this leads to an error in MATLAB. If the output was taken within . 12. What is the default variable used to represent the laplace transform in the output? Explanation: The default variable used to represent the laplace transform of a function, by the laplace command, is ‘s’. This can be altered by giving different input to the laplace commad. 13. A causal system is stable if the pole lies on the right half of the s-plane. Explanation: If the pole lies on the right half of the s-plane, it will be seen that the laplace transform is not absolutely converging and hence, the system won’t be stable. Thus the above statement is false. 14. The laplace transform of the following function. Explanation: The above function can be represented in terms of step functions. Only option L(3u(t)-3u(t-5)) is the correct representation of the given function in terms of step functions and thus the Laplace transform of that function only will yield the laplace transform of the given function in MATLAB. 15. What will be the output of the following code? Explanation: The output would’ve been 1, representing u(t) i.e. the step function. But the input has been given within ‘ ’ which leads to an error since the function is now represented as a string.